In celebration of YESTERDAY's release of UNIVERSAL CLASSIC MONSTERS: The Essential Collection, and HALLOWEEN TODAY we have an embeddable slideshow of rarely seen images from the films! Even in black and white, these creatures continue to haunt and horrify audiences. 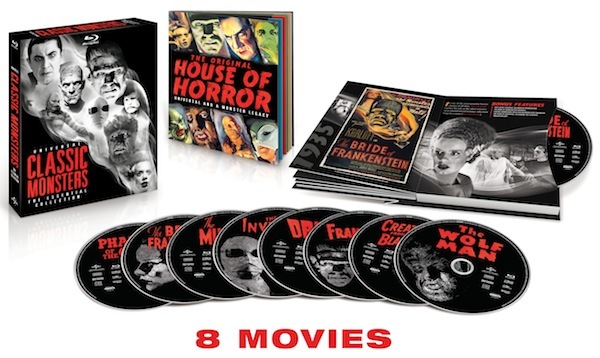 The Ultimate Box Set with eight Films Plus Over 12 Hours of Bonus Features Arrives October 2nd, Just in Time for Halloween! Universal City, California, June 28, 2012--For the first time ever, eight of the most iconic cinematic masterpieces of the horror genre are available together on Blu-rayTM as Universal Classic Monsters: The Essential Collection [Blu-ray] debuts on October 2, 2012 from Universal Studios Home Entertainment. 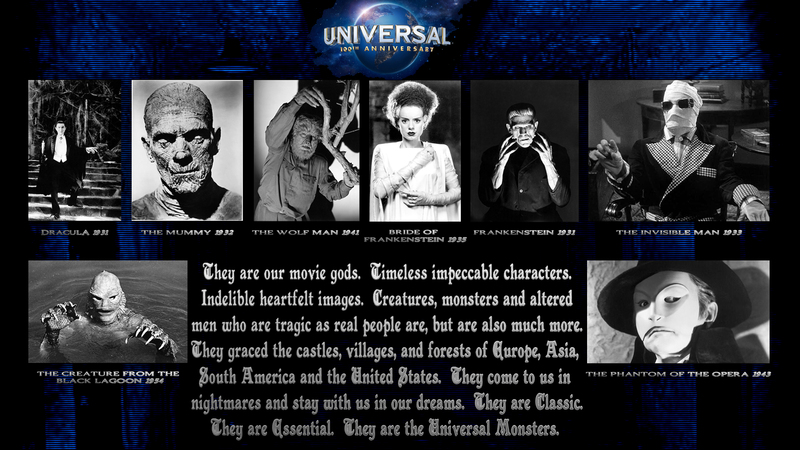 Digitally restored from high resolution film elements in perfect high-definition picture and perfect high-definition sound for the first time ever, Universal Classic Monsters: The Essential Collection [Blu-ray] brings together the very best of Universal's legendary monsters--imaginative and technically groundbreaking tales of terror that launched a uniquely American movie genre. This definitive collection features eight films on Blu-rayM, a collectible 48-page book featuring behind-the-scenes photographs, original posters, correspondence and much more. Each iconic film is accompanied by an array of bonus features that tell the fascinating story of its creation and history, including behind-the-scenes documentaries, filmmaker commentaries, interviews, storyboards, photo galleries, and trailers. Especially appealing for fans are a never-before-seen featurette about the restoration of Dracula and the first ever offering of Creature from the Black Lagoon in its restored Blu-rayTM 3D version. From the era of silent movies through the present day, Universal Pictures has been regarded as the home of the monsters. 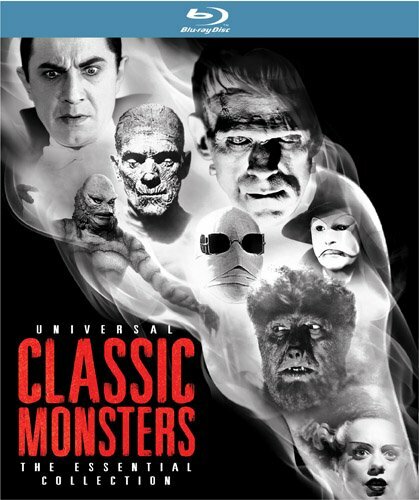 Universal Classic Monsters: The Essential Collection [Blu-ray] honors the studio's accomplishments with the most iconic monsters in motion-picture history including Dracula, Frankenstein, The Mummy, The Invisible Man, Bride of Frankenstein, The Wolf Man, Phantom of the Opera and Creature from the Black Lagoon. Featuring performances by legends of the horror genre, including Bela Lugosi, Boris Karloff, Lon Chaney, Jr., Claude Rains and Elsa Lanchester, these eight iconic films also feature groundbreaking special effects and innovative makeup that continue to influence filmmakers into the 21st century. 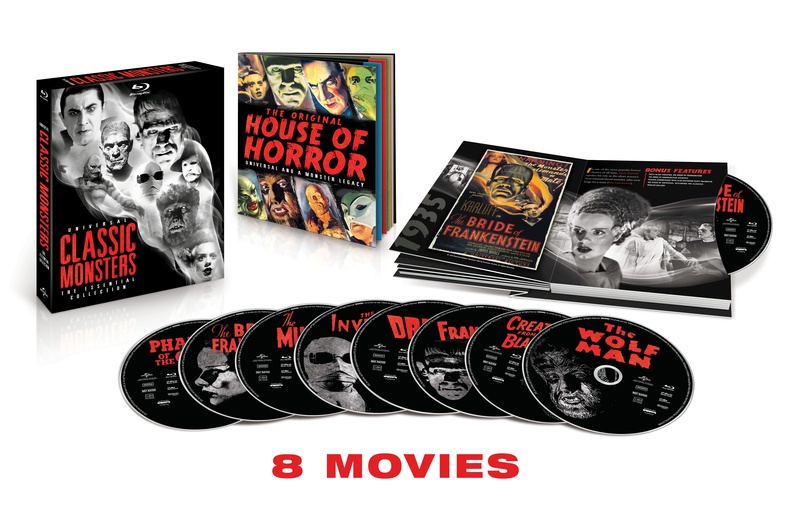 Sure to be a Halloween favorite for years to come, Universal Classic Monsters: The Essential Collection is the ideal gift for film buffs and horror aficionados alike. The original 1931 movie version of Bram Stoker's classic tale has for generations defined the iconic look and terrifying persona of the famed vampire. Dracula owes its continued appeal in large part due to Bela Lugosi's indelible portrayal of the immortal Count Dracula and the flawless direction of horror auteur Tod Browning. The Universal Classic Monsters: The Essential Collection includes the original version of this chilling and evocative tale, as well as the rarely seen Spanish version of Dracula. Filmed simultaneously with the English language version, the Spanish version of Dracula is an equally ominous vision of the horror classic shot with the same sets and script. Cinematographer George Robinson and a vibrant cast including CarlosVillarias and Lupita Tovar deliver a chilling and evocative tale filled with the same terror, mystery, and intrigue. * Dracula: The Restoration - New Featurette Available for The First Time! Boris Karloff stars as the screen's most tragic and iconic monster in what many consider to be the greatest horror film ever made. Dr. Henry Frankenstein (Colin Clive)dares to tamper with the essential nature of life and death by creating a monster (Karloff) out of lifeless human body parts. Director James Whale's adaptation of the Mary Shelley novel and Karloff's compassionate portrayal of a creature groping for identity make Frankenstein a timeless masterpiece. Horror icon Boris Karloff stars in the original 1932 version of The Mummy in which a team of British archaeologists accidentally revives a mummified high priest after 3,700 years. Alive again, he sets out on an obsessive--and deadly--quest to find his lost love. Over 50 years after its first release, this brooding dream-like horror classic remains a cinematic masterpiece. Claude Rains delivers an unforgettable performance in his screen debut as a mysterious doctor who discovers a serum that makes him invisible. Covered by bandages and dark glasses, Rains arrives in a small English village and attempts to hide his amazing discovery, but the drug's side effects slowly drive him to commit acts of unspeakable terror. Based on H.G. Welles' classic novel and directed by the master of macabre, James Whale, The Invisible Man fueled a host of sequels and features revolutionary special effects that are still imitated today. * Pure in Heart: The Life and Legacy of Lon Chaney, Jr. Captured and imprisoned for scientific study, a living "amphibious missing link" becomes enamored with the head researcher's female assistant (Julie Adams). When the hideous creature escapes and kidnaps the object of his affection, a crusade is launched to rescue the helpless woman and cast the terrifying creature back to the depths from which he came. Featuring legendary makeup artist Bud Westmore's brilliantly designed monster, Creaturefrom the Black Lagoon is an enduring tribute to the imaginative genius of its Hollywood creators. In honor of its Centennial anniversary, Universal Pictures proudly salutes 100 years of unforgettable films that have entertained audiences and touched the hearts of millions around the globe. In celebration of its first 100 years, UniversalStudios Home Entertainment is proud to present a selection of its many beloved movies as part of an extensive year-long program that underscores the studio's rich cinematic history and indelible cultural impact. Universal Studios Home Entertainment is a unit ofUniversal Pictures, a division of Universal Studios (www.universalstudios.com). Universal Studios is a part of NBCUniversal, one of the world's leading media and entertainment companies in the development, production and marketing of entertainment, news and information to a global audience. NBCUniversal owns and operates a valuable portfolio of news and entertainment television networks, a premier motion picture company, significant television production operations, a leading television stations group and world-renowned theme parks. Comcast Corporation owns a controlling 51% interest in NBCUniversal, with GE holding a 49% stake.